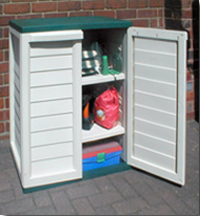 This space saving half size Utility Cabinet/Shed provides over 11 cu. ft of storage, and an ideal work-top area. Behind the easyaccess pad-lockable doors, the cabinet has 2 adjustable shelves. Unlike wooden sheds which take all day to build, it clicks together without tools in a few minutes.